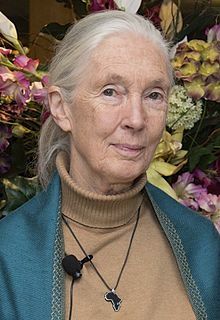 Valerie Jane Morris-Goodall (AKA Jane Goodall) was born in 1934 in London and at the age of 82 she is still a very significant figure of conservation, primatology, and naturalism that includes her Roots and Shoots program to help reach out to the younger generations to continue her efforts. Most people recognize the name Jane Goodall as a scientist and conservationist who is famous for her work with chimpanzees but her legacy will surely be reflected in her forward thinking of teaching younger children about international environmental and wildlife conservation. 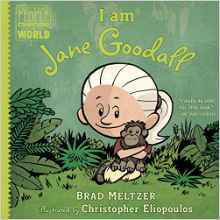 I am Jane Goodall is a beautiful picture book written by the New York Times bestselling author, Brad Meltzer. Meltzer does a wonderful job of focusing on a role model’s character traits in a simple but vivacious way. Goodall’s life is discussed in first person present tense and is extremely accessible to young children. Children learn why Goodall’s contributions to society are so important and features photos, timelines, quotes, and a list of sources of reference to do further research. It was a wonderful book to read to my oldest daughter since we recently watched a Jane Goodall documentary. I was so impressed by this book that when I learned this was the TENTH book in this series called ‘Ordinary People Change the World), that I immediately started to track down the nine books that came before it. Brooke and I are excited to read each one! About the Jane Goodall Institute: The Jane Goodall Institute was founded by the famous primatologist, Jane Goodall, with the goal of international environmental and wildlife conservation and headquartered in Arlington, Virginia. Learn how you can help support the Roots and Shoots youth program supported by the Institute. Check out the website for the Jane Goodall Institute here. About the Author: Brad Meltzer is the New York Times bestselling author of Heroes for My Son, Heroes for My Daughter, and a number of suspense novels for adults. He is also the host of the History Channel television shows Brad Meltzer’s Decoded and Lost History. He lives in Florida with his wife and their three children. About the Illustrator: Christopher Eliopoulos began his illustration career as a letterer for Marvel, and has worked on thousands of comics, including Franklin Richards: Son of a Genius, Pet Avengers, and Cow Boy, all of which he wrote and illustrated. He lives in New Jersey with his wife and their identical twin sons.